The Gymnastics Zone Boys Junior Olympic Team led by head coach Mike Terhorst are seeing the results of all of their hard work paying off. 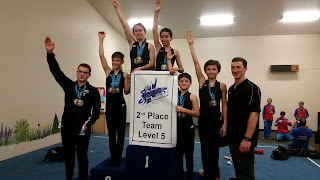 The level 4 and 5 teams competed last weekend at the Oroville Invitational hosted by and held at Oroville Gymnastics. Ethan Exum – fifth on floor, sixth on pommel, third on rings, first on vault, first on parallel bars, first on high bar and first all-around with a score of 58.800. Orion Seal – seventh on floor, third on pommel, eighth on rings, sixth on vault, second on parallel bars, ninth on high bar and fifth all-around with a score of 55.200. Leonardo Deeik – third on floor, fourth on pommel, ninth on rings, sixth on parallel bars, seventh on high bar and fifth all-around with a score of 55.200. Gabriel Deeik – sixth on pommel, sixth on rings, eighth on parallel bars, third on high bar and eighth all-around with a score of 54.400. Thomas Malloy – ninth on floor, fifth on pommel, ninth on rings, third on parallel bars, second on high bar and fourth all-around with a score of 56.600. Mario Delanni – fourth on floor, ninth on rings, third on vault, fifth on parallel bars, fourth on high bar and sixth all-around with a score of 56.300. Riley Grinnell – seventh on floor, third on pommel, fourth on parallel bars, eighth all-around with a score of 55.900. Matthew Payne – ninth on floor, eighth on pommel, eighth on rings, ninth on vault and ninth all-around with a score of 53.800. Logan Nations – twelfth all-around with a score of 49.500. The Level 4 Team placed third with a score of 175.700. Petar Zivkovic – second on floor, first on pommel, second on rings, seventh on vault, third on parallel bars, seventh on high-bar and third all-around with a score of 62.500. Lukas Rieken – fourth on floor, sixth on rings, seventh on parallel bars, second on high bar and sixth all-around with a score of 59.000. Liam Wallace Harper – seventh on floor, eighth on pommel, ninth on rings, fourth on vault, seventh on parallel bars, third on high bar and seventh all-around with a score of 58.800. Eamonn Weinstock – seventh on vault and twelfth all-around with a score of 54.600. Noah Pack – second on floor, first on pommel, fifth on rings, fourth on vault, fourth on parallel bar, first on high bar and second all-around with a score of 62.500. Emilio Delanni – ninth on rings, fourth on vault, eighth on parallel bars, sixth on high bar and twelfth all-around with a score of 54.100. 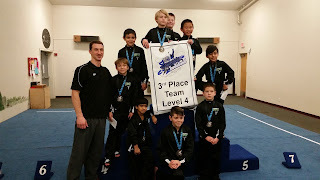 The level 5 team placed second with a score of 185.400. The boy’s team will compete next on February 19 – 21 at the Gold Country Classic hosted by Accel Gymnastics and held at the Oakland Marriott.